Music is a very important part of how I experience anime, and film media in general. It’s something that I find is often underdiscussed among fans, and as a musicologist who focuses on film scores, I find that a shame. It’s a very key part of any film work’s emotional experience, just one that succeeds too well to the point that it slips under our noses. It’s usually subliminal, and on top of that, a lot of people don’t know how to talk about music. 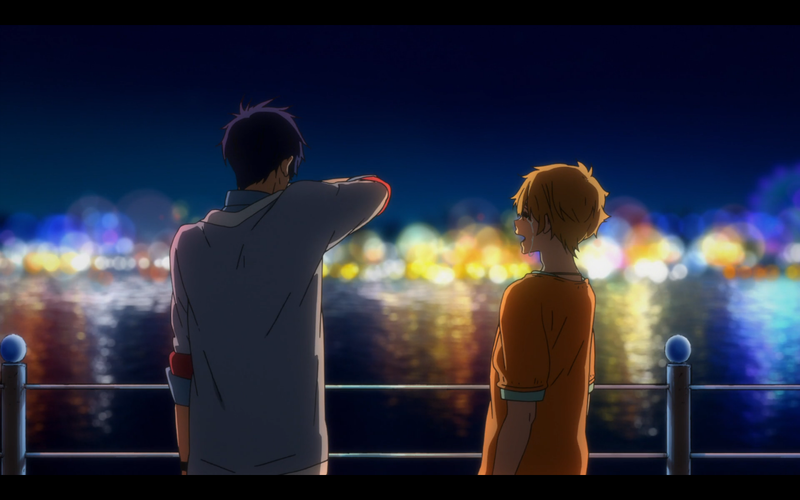 Well, I do, and since I already wrote up a top five favorite series of the year post for ANN, this one covers my favorite TV anime soundtracks of 2014. As a show about classical music, it’s predictable to put Your Lie in April on here, I suppose. Of course it has good music, with all the classics in its repertoire, and of course it uses them well, since the characters are performing them and usually picked them for highly personal reasons. (One such example in the above clip, where Kaori plays a piece by Beethoven. Both her and Kosei choose Beethoven pieces early on, representing their tortured paths to and forms of artistry.) Yet, the show’s original score also shines brightly, full of ambient minimalism as a backdrop to its many personal and psychological scenes. Even beyond the Beethoven and Chopin, Your Lie in April’s music is worthy of a standing ovation. A lot of Mushi-shi is an exercise in “less is more,” and that’s as true with its music as it is with anything else. Mushi-shi is very minimally scored, preferring to let the sound effects of nature do its talking for it a lot of the time. So when it does have music, it can be quite striking, even if it’s just a quick motif on a solo instrument. The dissonant chimes that come in whenever Ginko starts explaining the mushi-of-the-week are jarring, shaking awake the viewer and the feature character to listen to his explanations for the cosmic-horror-of-the-week. Yet, its music can also gently sing you to sleep again, as in the lullabies that drift into the ending credits. The track I picked is one that falls somewhere in the middle, usually coming in as the mushi works its magic. Mushi-shi’s score is pure leitmotif, only coming out sparingly for a very singular idea or mood, like the shy mushi themselves. The slice-of-life comedy genre rarely climbs to the top of OST lists, since so much of it leans toward the predictable. It’s the same gentle piano flourishes with maybe a bit of bouncy pop when things get silly. Nozaki-kun had some of this, but it was always memorable and original in its own way. This was especially true in its choice of instruments. The tuba is the best comedy instrument, and it was the perfect accent for Nozaki, the deep-voiced stoic with a silly streak. Why don’t more comedy anime use the tuba? Why don’t more everything use the tuba? Like everything in Bahamut, its music sounds like a big Hollywood movie: from the frantic strings for rising action to the ominous choruses for big reveals. It’s the sort of epic fantasy scoring you’d expect in your Lord of the Rings and other movies about long journeys to fight CGI dragons or orcs, because that’s the sort of beast that Bahamut is. I think my favorite and most memorable part of the score is all the weird little western flourishes whenever Favaro did something badass, like trumpet fanfares. It’s not as creative as I initially expected it to be, which is why it isn’t higher on this list, but there’s a lot to love about Bahamut’s music anyway. I didn’t do a 2013 list, so I decided to include shows that started then but continued into the next year–and with those parameters, I couldn’t not include Kill la Kill. It had some of the most memorable and fun OST tracks in a long time, the kind that fans download right along with the OPs and EDs. Personally, I wasn’t always a fan of the way the music was used in the series’ first cour, but it picked up steam by the time January rolled around. The musical styles fit the series like a glove: They could range in mood from silliness to pumping you up, but the score was always as bombastic as what was happening on screen. Like a lot of Kill la Kill viewers, my favorite track by far was Ragyo’s leitmotif, “Blumenkranz” (linked above), the singer’s clumsy German pronunciation aside. Hiroyuki Sawano sure has a knack for bringing the musical energy to battle-centric popular favorites. I liken Mushi-shi to a warm blanket. It’s the kind of show I turn on when I want to be in a meditative mood. In this age of digital streaming and Twitter, it’s easy to fall into the trap of live-tweeting while watching a show. It’s fun to do, but can distract from the mood of a show, and Mushi-shi is at its most effective in a dimly-lit room with all distractions removed. You need to let the emotion of the show take you in completely to get the most out of it. Mushi-shi is not bombastic, action-packed, or comedic like a lot of other anime from this year that I love, but it serves as a nice counterpoint to shows like that. The second season of Mushi-shi has many stellar episodes that put me in a good mood, but one of my favorite episodes is a little chillier, yet all the more warm for it. This blanket is anything but warm. 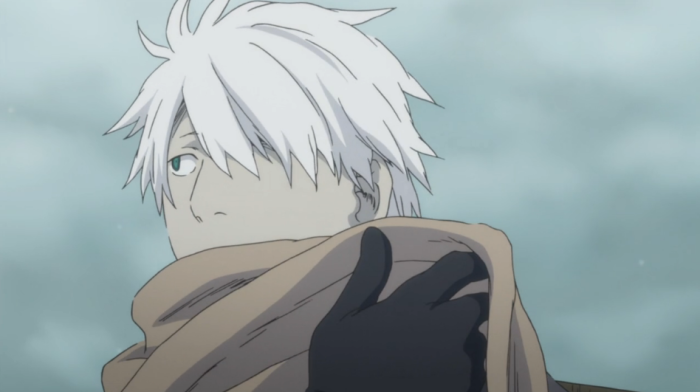 “Beneath the Snow” is the third episode of Mushi-shi‘s second season. Each episode of Mushi-shi acts as its own complete story, centering around someone inflicted by a mushi, a supernatural creature with many forms and abilities. Beyond the mushi and Ginko, a mushi-shi or “mushi doctor”, each episode is standalone with a different cast of characters and different conflict. The victim of “Beneath the Snow” is Toki, who has been possessed by a Tokoyukimushi, a type of mushi that consumes the warmth of its host and causes permanent snowfall. Ginko warns Toki that if he is unable to get warm, he’ll lose his limbs to frostbite, but Toki ignores his advice because the cold doesn’t bother him. What makes for a great episode of Mushi-shi is not the fantastical nature of the mushi, but the human emotion in the metaphor the mushi represent. Often, the real problems characters face are not caused by mushi, merely exagerrated by them. What Toki suffers from most of all is the grief of losing his sister and being unable to move past it. It’s startlingly real in the face of the supernatural elements, but this is one of Mushi-shi‘s greatest strengths. His inability to feel anything and his avoidance of warmth, even the warmth of human touch, reflects his emotional state of being. He’s locked in a state of self-destruction. The story is about exorcising personal demons and coming back to the world of living. The beautiful and deadly stillness of snow is a perfect setting for such a story. 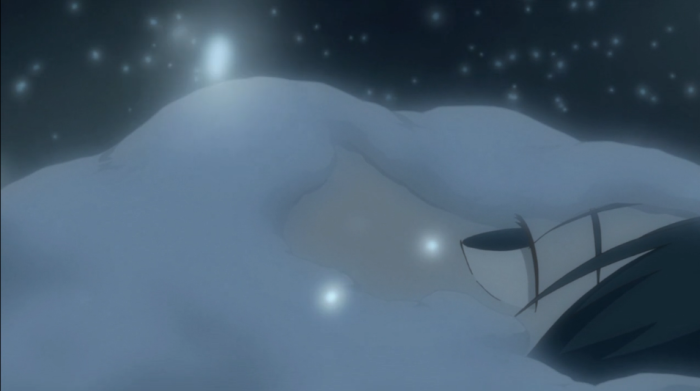 Snow is harsh and cold, but it makes the emotional journey all the more heartwarming when Toki regains his ability to feel in the end. This is an episode for those who love stories of overcoming despair. Stories like Madoka Magica and Wolf’s Rain are near-and-dear to my heart for similar reasons. “Beneath the Snow’s” setting even makes it a great companion piece to Wolf’s Rain if you’re in the mood for great anime in wintery locations. Not many episodes of Mushi-shi‘s second season actually take place in winter and it aired in spring and fall of this year, but I can’t help but associate it with winter because of the show’s opening theme, “Shiver” by Lucy Rose. With its quiet folk tune and icy imagery, it just screams winter. While I may not live in a snowy climate, to me Mushi-shi seems like the perfect show to watch when its cold outside and you want to feel warm. Wrap yourself in a hot blanket, drink hot chocolate, turn off all distractions, watch some Mushi-shi and you’ll feel like you’ve been transported into a different realm. After the episode is over, the feelings still linger, as if you too have been possessed by a mushi. Bonus cute Ginko in a scarf. In the spring season, the two far-and-away best series (by most viewers’ estimations, anyway) were Jojo’s Bizarre Adventure: Stardust Crusaders and the new season of Mushi-shi. The latter’s new season was vastly superior to even the excellent first, and a lot of people felt the same way about Jojo’s (as I make my way through the first two arcs, I’m not entirely sure I agree with this). Since just about everyone was watching and enjoying both of these shows and they aired on the same day (Friday), they gained their own nickname on Twitter: the “Jojoshi Power Hour.” A lot of it was a joke about what completely opposite shows they were (as I briefly detail here), and how jarring it was sometimes to watch them back-to-back. Yet, a surprising number of us started doing that, including me. Those Fridays in spring were some of the best hours I’ve had in anime-viewing this year. In the summer, there was the Fujoshi Power Hour on Wednesdays, with fangirl-bait Free! 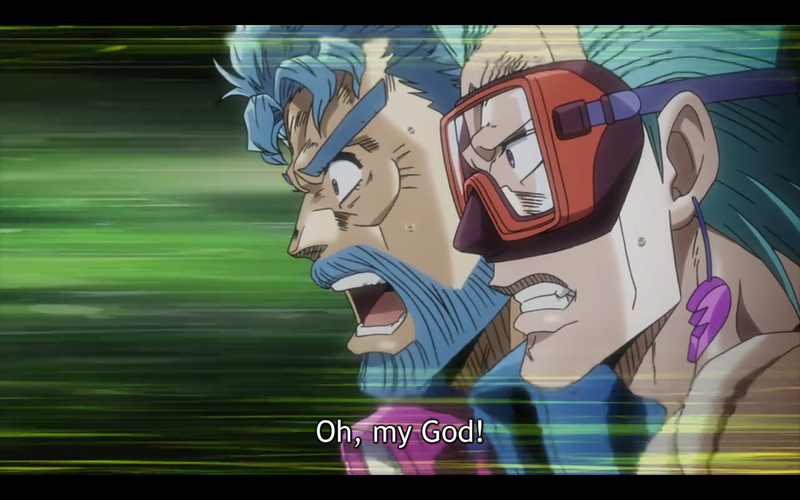 Eternal Summer and actual BL title Love Stage both airing that day. I loved both those shows and, with the exception of Free!’s weird (but excellent) streak of more psychological episodes in the middle, they usually hit the same tonal notes for me. So I could easily mix and match them, though Free! coming out a few hours earlier meant it was usually what I watched first. But not always. Sometimes, I just need to wake up my senses on Wednesdays with the clueless baby-gays. 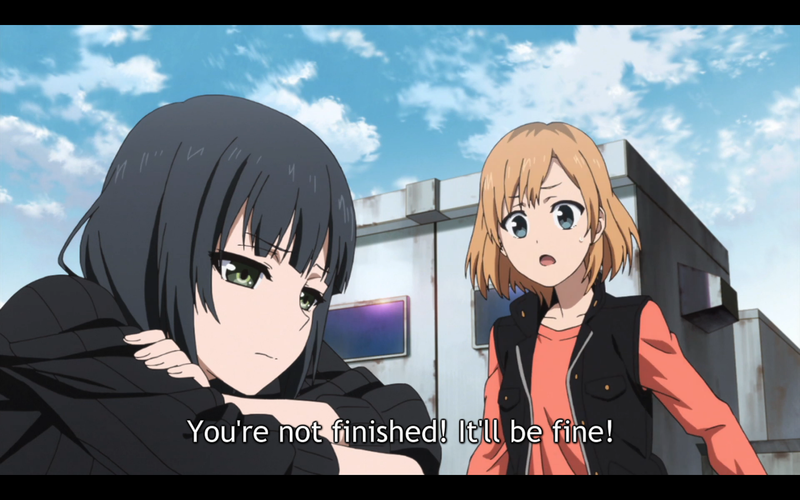 This season’s “power hour” is the ART Hour on Thursday, when we have Shirobako and Your Lie in April. Both deal with the struggles of young people trying to make it in artistic fields, with a mixture of comedy and drama. (The latter is considerably more dramatic than the former.) This is one I can’t really “break,” per se, because I have to review both shows for ANN. It still makes it kind of difficult to watch them back to back considering their overlapping subject matter, and how much both resonate with my life as a writer and musician. I kind of have to put a few hours’ distance between my viewings of each just to make sure my impressions don’t bleed into each other. I envy some of my friends who can watch them days apart, and not have to go through an existential crisis about their career every Thursday. There were less “powerful” hours, too, this year. Saturdays in the summer, Aldnoah Zero and Captain Earth formed my “mecha” hour, and both ended up failures to various degrees. (Aldnoah Zero was at least like watching a trainwreck in slow-motion. Captain Earth was just boring.) That was a slog, and if I got through it, it was just that the “hour” gave me the chance to burn it out of my system really quickly. The things I do for you, anime, and my desire to be a well-rounded anime watcher who’s seen both the good and the bad. I’m interested to see if the next year will bring with it any oddly similar (or in the Jojoshi case, strikingly dissimilar) shows that happen to be airing the same day, that we can organize these ways. Bring on the winter season and its own power hours!